From left: Cpl Vicky Helsby, L/Cpl Kat Dixon and Pte Beth Johnson, during a demonstration on Salisbury Plain. Women will be able to apply for any role in the military, including the SAS, the defence secretary Gavin Williamson has announced. Women already serving in the Army are able to transfer into infantry roles, while those not currently serving will be able to apply for infantry roles from December. 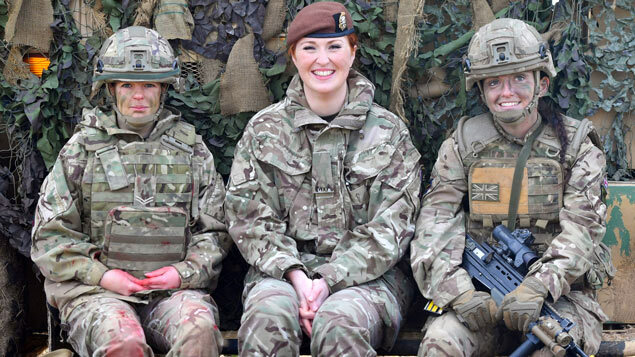 “Women have led the way with exemplary service in the armed forces for over 100 years, working in a variety of specialist and vital roles,” said Williamson. “So I am delighted that from today, for the first time in its history, our armed forces will be determined by ability alone and not gender. Williamson confirmed that women are now able to apply to join the Royal Marines, with selection starting before the end of this year. Training will begin at the commando training centre in Lympstone in early 2019. Women have served in combat facing roles for many years, but were banned from ground close combat roles until the ban was lifted by David Cameron in 2016. The Ministry of Defence said it does not necessarily expect large numbers of women to apply for ground close combat roles; the changes are aimed at creating opportunities for individuals from all backgrounds and making the most of their talents. “By making all branches and trades of the military open to everyone, regardless of their gender, the armed forces are building on their reputation of being a leading equal opportunities employer,” it said in a statement. But retired Col Richard Kemp said: “My experience is if you have a team of men, even with one or two women, it could lead to divisiveness.